The 2017 Ford GT that was sold at Mecum in May and goes back to Mecum in August. Mecum Auctions sold a 2017 Ford GT for nearly $1.7 million in May, much to the distress of Ford and its buyer contract that, on paper, aimed to prevent quick resales. But rather than finding a true home at Mecum, this Ford GT found an expensive game of hot potato. It goes back to auction at the end of August. 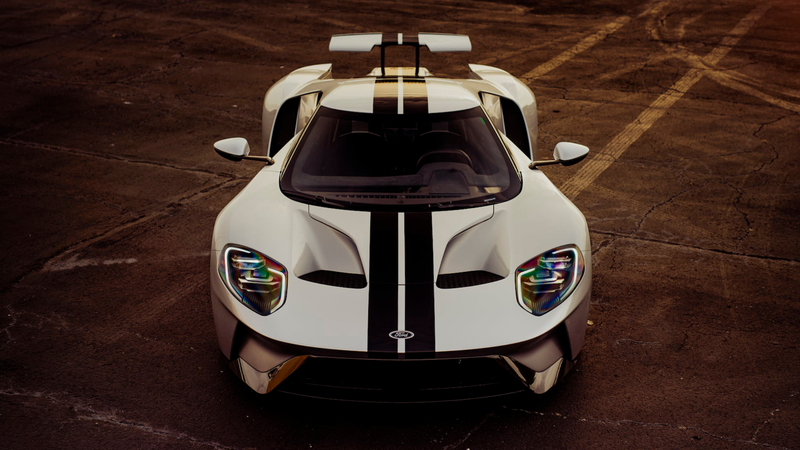 Ford brought the GT back starting in the 2017 model year with 647 horsepower, a 3.5-liter twin-turbo V6 and a seven-speed dual-clutch transmission, letting potential buyers apply for the chance to buy a car with a $450,000 base MSRP. The company then handpicked 500 of the 7,000 original applicants to honor them with the ability to purchase a car, but other than the $500,000 payout, there was one big catch: Buyers had to sign an agreement to not resell the car within the first two years of ownership. That’s proven to be a little difficult to enforce. First, there was pro wrestler John Cena’s Ford GT, which went through several channels after Cena sold it. Ford sued both Cena and a dealer that later bought and resold the car again in late 2017, settling with both in June. One of the main claims in Ford’s lawsuit against the dealer centered around the assumption that the dealer knew of Cena’s contract with Ford and bought the car anyway. Shortly before those settlements, a mysterious new GT popped up on the resale scene: a silver car with black racing stripes on the Mecum Auctions website, scheduled to sell in the middle of May. Turns out, that GT has been sold more times than most Craigslist hobby project vehicles that “don’t look so bad” at first. Its latest sale listing is at Mecum, again, in August—just over three months after its current owner bought it from that very auction house. Ford sued Mecum over the GT on May 17 as listed in Indiana court records, only two days before it was scheduled to, and did, sell at auction on May 19. Court documents in that case showed the Mecum sale wasn’t the first, and that its original owner had sold the car to the person sending it to Mecum. A VIN report run by friend of Jalopnik Bozi Tatarevic showed that the original owner, Jack Miller, titled the GT in August 2017. It was later sold to Michael J. Flynn, and then wound up at Mecum’s Indianapolis auction in May, where it was listed as a main attraction. The listing also said the car was the 48th of 250 made for the 2017 model year, and that it had only seven miles on it. The car popped up on a Facebook page for Type A Motorsports in Arlington, Texas that day, with the dealer saying it bought the car at Mecum. A DuPont Registry listing came around later with the seller listed as Type A and the car listed for $2 million (or $20,302, in monthly payments—cheap! ), or about $350,000 more than the dealer paid for the car at its first auction. That’s a total of three owners so far, if you’re keeping count. Then the new Mecum listing came up, listing a silver GT as a main attraction at its Monterey, California auction in August. It had the same features as the first ad—No. 48 of 250 in 2017, same specs—with an extra mile on the odometer, clicking it up to eight miles on the clock in more than a year since it was built. The VIN on the listing is the same as the one listed in Ford’s lawsuit against Mecum, meaning this GT will probably have yet another new owner soon. Jalopnik reached out to Type A Motorsports on why it chose to take the car back to Mecum rather than selling it outright and on whether the dealer had heard from Ford about another resale, and the dealer didn’t have immediate comment on either. Jalopnik couldn’t find any new court cases from Ford about GT resales in state or federal courts since the Mecum lawsuit, but with how that one has gone so far, Ford hasn’t seemed to have much luck in pursuing it. Under Welch’s ruling, Ford’s case to stop sales essentially gets weaker with every new owner. The case is still open; that was just the denial of the request by Ford to stop the May auction. But with how this GT is getting tossed around once every few months, maybe that confident Mecum representative with a microphone at the Indianapolis auction had the right idea. “The Judge did rule in Mecum’s favor, that we could sell this car, and if Ford wanted it back, they were welcome to come here and bid on it,” the rep said as the GT came out for auction in May. “So, this is a publicly legal sale of a Ford GT. We had some people worried there were going to be some repercussions.